We’d love your help. Let us know what’s wrong with this preview of Nate in Venice by Richard Russo. In this warm, bighearted novella, Pulitzer Prize winner Richard Russo ("Nobody’s Fool," "Straight Man," "Empire Falls") transports his characters from the working-class East Coast of his novels to one of Europe’s most romantic cities. In classic Russo fashion, however, he packs along their foibles and frailties. His latest foray into the messy beauty of the human heart, "N In this warm, bighearted novella, Pulitzer Prize winner Richard Russo ("Nobody’s Fool," "Straight Man," "Empire Falls") transports his characters from the working-class East Coast of his novels to one of Europe’s most romantic cities. In classic Russo fashion, however, he packs along their foibles and frailties. His latest foray into the messy beauty of the human heart, "Nate in Venice" is written with the same wry humor and ready generosity for which he’s been so richly praised. After a tragic incident with a student, Nate, a professor at a small New England college, retires from teaching and from life. He ends his self-imposed exile with a tour-group trip to Venice in the company of his overbearing, mostly estranged brother. Nate is unsure he’s equipped for the challenges of human contact, especially the fraternal kind. He tries to play along, keep up, mixing his antidepressants with expensive Chianti, but while navigating the labyrinthine streets of the ancient, sinking city, the past greets him around every corner, even in his dreams: There’s the stricken face of the young woman whose life he may have ruined, and there’s Julian, the older brother who has always derided and discounted him. Is Nate sunk? Is the trip, the chance to fall in love—in fact, his whole existence—merely water under the ponte? Maybe or maybe not. In Russo’s world, the distance between disaster and salvation is razor thin, and a mensch can be a fool (and vice versa). Nate’s Venetian high-wire act proves as harrowing as a potboiler and as full of reversals as a romantic comedy. It’s an emphatic tribute to all the pleasures and possibilities of the novella. Award-winning novelist and screenwriter Richard Russo is the author of seven novels and two short-story collections. "Empire Falls" won the Pulitzer Prize for fiction in 2002. His most recent book is the memoir "Elsewhere." He lives with his wife in Portland, Maine. Published January 28th 2013 by Byliner Inc.
To ask other readers questions about Nate in Venice, please sign up. The thing I like about Russo is that he’s dependable—I have never disliked any of his books and I’ve read most of them. This was no exception. He’s just a damn good writer. I have only read one other book that Richard Russo has written and that was Empire Falls which was a wonderful book that I really enjoyed. I don't know why I haven't picked up any of his other books by now but I really need to. This was a great story and now I will devour every book Richard Russo has written. I am a huge fan of Richard Russo. I thoroughly enjoyed Empire Falls, The Straight Man, and The Whore's Child and other stories. This one not so much but mainly because I thought it was only about 75% complete. Several of the top tier literary writers have joined the trend of releasing novellas between releases of their longer works: Joyce Carol Oates (Patricide: A Novella), Anne Tyler (The Beginner's Goodbye), Margaret Atwood (I'm Starved for You), Saul Bellow (The Actual) and Phillip Roth (Everyman). All of these books are very good and give a reader a sense of the style and voice, the humor and insight, and the wicked edge that these great writers bring to all of their works. I liked Nate in Venice. I just didn't love it. It was well written. I don't think Richard Russo can write badly if he tried. There is the sophisticated humor, cutting social and cultural commentary, and complex characters that we find in all of Russo's works. He is a Pulitzer prize winner for a reason. Richard Russo's novella about a just-retired English professor is an engaging page-turner. The simple title had me expecting a coming-of-age story, which I suppose it is, but not the kind I was expecting. Nate is sixty, not twenty, but in some important ways, he still needs to find his way, and it's a relief to this reader that it's never too late. Nate in Venice is a very short piece of fiction, so I hate to say too much, except that the narrative ended before I was ready. That's okay, though, Richard Russo's novella about a just-retired English professor is an engaging page-turner. The simple title had me expecting a coming-of-age story, which I suppose it is, but not the kind I was expecting. Nate is sixty, not twenty, but in some important ways, he still needs to find his way, and it's a relief to this reader that it's never too late. Nate in Venice is a very short piece of fiction, so I hate to say too much, except that the narrative ended before I was ready. That's okay, though, I can let it go (good advice). I am a bit obsessed with Italy, so when I stumbled upon this shor-vella (totally made-up word: too long to be a short story, too short to be a novella) I knew I had to read it. While my initial focus/interest was on "returning" to Italy, Nate in Venice ended up being an instance of an increasing personal favorite pseudo-genre of books, one I recently "discovered" had a name: the white male f&ck-up novel. Being a white male who has suddenly found himself in a middle-age bracket, I find that I I am a bit obsessed with Italy, so when I stumbled upon this shor-vella (totally made-up word: too long to be a short story, too short to be a novella) I knew I had to read it. While my initial focus/interest was on "returning" to Italy, Nate in Venice ended up being an instance of an increasing personal favorite pseudo-genre of books, one I recently "discovered" had a name: the white male f&ck-up novel. Being a white male who has suddenly found himself in a middle-age bracket, I find that I can relate to these stories or, alternatively, take some comfort in *not* being as much of a f&ck-up as some of these characters. So alas, Nate has messed up and finds himself in Venice. And while this story did not quite give me the large and longing doses of Venezia I may have hoped for, it does provide quite the appropriate setting for someone who finds himself a bit lost and even sinking. Thoroughly enjoyable tale of an underdog, sabotaging himself and ultimately triumphing in his own understated way. Anything Richard Russo writes automatically goes to my to-read list. He's certainly my favorite author, and I enjoyed this novella about as much as I could have hoped. Part of the joy of reading Russo is the depth of the characters, not just in terms of pure character development, but in the way he develops a deep bench of supporting characters. The quirky, small-town or collegiate types are among the highlights of any Russo novel, and probably his biggest strength as a writer. So in a novella, Anything Richard Russo writes automatically goes to my to-read list. He's certainly my favorite author, and I enjoyed this novella about as much as I could have hoped. Part of the joy of reading Russo is the depth of the characters, not just in terms of pure character development, but in the way he develops a deep bench of supporting characters. The quirky, small-town or collegiate types are among the highlights of any Russo novel, and probably his biggest strength as a writer. So in a novella, I knew going in that I was unlikely to get that same cast of characters, nor the same development of anyone save the main character. For the most part, this was correct. Our protagonist, the titular Nate, is an older, retired college professor who is visiting Venice with his somewhat estranged brother Julian. They are part of an American tour group that is going around Venice, and Nate and Julian's strained relationship worsens, though Nate has little idea why. This novella really is a message about getting on with your life and accepting where you are in it. We are given flashback chapters showing Nate's last days as a professor before he was controversially ousted, a fact he obviously still struggles with. And we are also told of the complexities of Nate and Julian's relationship, and Nate's own struggles with a love life and how that is all tied together. What an interesting little piece of writing. It's a Kindle "single," I can hardly count it toward my 2013 Book Challenge, but I wanted to say something about it anyway. The thing I noticed most was the author's use of tense change to move between the past, the distant past, and the present. It wasn't seamless, and I found myself annoyed in places due to the changes. That said, the characters were interesting, and remarkably well-drawn given the brevity of this piece. In the end, I was happy for What an interesting little piece of writing. It's a Kindle "single," I can hardly count it toward my 2013 Book Challenge, but I wanted to say something about it anyway. The thing I noticed most was the author's use of tense change to move between the past, the distant past, and the present. It wasn't seamless, and I found myself annoyed in places due to the changes. That said, the characters were interesting, and remarkably well-drawn given the brevity of this piece. In the end, I was happy for Nate. My favorite part was when he realized he had black teeth. It made him human in a way that the rest of the story had somehow managed to NOT achieve. Or maybe that was Russo's plan all along - no slouch of a writer, Russo, after all. The story felt like I was watching Nate move along, until the teeth moment, when I really connected with him. That is possibly also the moment he actually connected with himself. i can't tell if russo's work is slipping or whether his characters are simply losing relevance for me. i loved the first half dozen of his novels that i read — filled with characters that were complexly imperfect, variably misinterpreted by the world and, as a consequence, deeply real and compelling. yet, with every passing book i read, i find this to be less the case, and particularly so with nate. perhaps it was the shorter format, maybe its that the novelty of russo's style is wearing off — b i can't tell if russo's work is slipping or whether his characters are simply losing relevance for me. i loved the first half dozen of his novels that i read — filled with characters that were complexly imperfect, variably misinterpreted by the world and, as a consequence, deeply real and compelling. yet, with every passing book i read, i find this to be less the case, and particularly so with nate. perhaps it was the shorter format, maybe its that the novelty of russo's style is wearing off — but, rather than empathizing and understanding nate's limitations (as with russo's earlier delightfully shabby protagonists), i found him unpersuasively weak and dense. particularly in the short form his ancillary characters also fail to work — they're sketches of russo characters that might have worked as opposed to the true article. Nate has a close encounter of the unpleasant kind in his college classroom and pretty much hangs up his gloves and retires from life. He has an opportunity to maybe return to the living with an excursion to Venice, Italy with some other people and his brother and goes. Within that trip we learn in bits and pieces what happened in the classroom with a young lady with Asbergers Syndrome, except that no, we really don't. In the meantime, Nate and his brother Julian battle out old grudges and hostil Nate has a close encounter of the unpleasant kind in his college classroom and pretty much hangs up his gloves and retires from life. He has an opportunity to maybe return to the living with an excursion to Venice, Italy with some other people and his brother and goes. Within that trip we learn in bits and pieces what happened in the classroom with a young lady with Asbergers Syndrome, except that no, we really don't. In the meantime, Nate and his brother Julian battle out old grudges and hostilities on the streets of Venice. This was a wonderful novella. It doesn't fall into my usual categories of mystery, thriller, historical, sic-fi, non-fiction reading choices. But, I enjoyed this more than most of what I've read in quite a while. It is a product of the Byliner series and I'll be getting more of their offerings in the future. I think this is an good example of what e-readers are doing for us - the return of novella length works. Russo makes every word count and dispenses with empty filler. He connects you with his This was a wonderful novella. It doesn't fall into my usual categories of mystery, thriller, historical, sic-fi, non-fiction reading choices. But, I enjoyed this more than most of what I've read in quite a while. It is a product of the Byliner series and I'll be getting more of their offerings in the future. I think this is an good example of what e-readers are doing for us - the return of novella length works. Russo makes every word count and dispenses with empty filler. Nate in Venice is a short little novella that Richard Russo published solely as an ebook. In the article I read about it he said he kept trying to make it into something larger, but it just wasn't happening so he thought it would be a great way to try out the ebook publishing platform. The book is centered around Nate a retired college professor who left his job after an unfortunate incident with one of his students. He has withdrawn from life until his brother Julian convinces him to go on an or Nate in Venice is a short little novella that Richard Russo published solely as an ebook. In the article I read about it he said he kept trying to make it into something larger, but it just wasn't happening so he thought it would be a great way to try out the ebook publishing platform. The book is centered around Nate a retired college professor who left his job after an unfortunate incident with one of his students. He has withdrawn from life until his brother Julian convinces him to go on an organized group trip to Venice. While on the trip the brothers fall into life long patterns in their uneasy fraternal relationship. The story started out interestingly enough. The reader feels "plopped" in the middle of Nate's life and gradually the key things that shaped it and brought it to where it is are brought out through his time with the Biennale group in Venice. As I read I was keen to find out what had happened with "the Mauntz girl" and the other key background pieces described in Nate's life were brought in in an interesting way. However, although I know it's a novella and it shouldn't go on for too long, towards The story started out interestingly enough. The reader feels "plopped" in the middle of Nate's life and gradually the key things that shaped it and brought it to where it is are brought out through his time with the Biennale group in Venice. As I read I was keen to find out what had happened with "the Mauntz girl" and the other key background pieces described in Nate's life were brought in in an interesting way. It's a long time since I read a Russo and I thought this novella might be just the thing to warm my heart after a rather gruelling (abandoned) novel. And it did that - I enjoyed the character of Nate, the retired English professor who had agreed to join an art tour of Venice with his brother and other ill-assorted characters. But there wasn't as much depth as I hoped - after recently reading the novella, Mothering Sunday by Graham Swift, I was struck by how comparatively shallow the plotting and It's a long time since I read a Russo and I thought this novella might be just the thing to warm my heart after a rather gruelling (abandoned) novel. And it did that - I enjoyed the character of Nate, the retired English professor who had agreed to join an art tour of Venice with his brother and other ill-assorted characters. But there wasn't as much depth as I hoped - after recently reading the novella, Mothering Sunday by Graham Swift, I was struck by how comparatively shallow the plotting and characterisation of this one was. It ended suddenly too - I hadn't noticed the 99% on my Kindle! Most of this feels like a continuation of Russo's dull "Bridge of Sighs," part of which also took place in Venice. Like that novel, this is less atmospheric than reading Venice's Wikipedia page. Most of the novella is Nate plodding around whining about his past mistakes with a student with Asperger's and his relationship with his brother. Between this and Russo's "That Old Cape Magic" it seems like Russo could be the champion of what I call "Viagra fiction", ie fiction targeted at aging yuppies, Most of this feels like a continuation of Russo's dull "Bridge of Sighs," part of which also took place in Venice. Like that novel, this is less atmospheric than reading Venice's Wikipedia page. Most of the novella is Nate plodding around whining about his past mistakes with a student with Asperger's and his relationship with his brother. Between this and Russo's "That Old Cape Magic" it seems like Russo could be the champion of what I call "Viagra fiction", ie fiction targeted at aging yuppies, the well-to-do oldsters you see featured in Viagra (and similar product) ads. So if you're an aging yuppie with a Viagra prescription you'd probably enjoy this more than me. It's almost torture that Russo has written a Novella of less than 100 pages, but I'll take it. He immediately draws you into a character-rich setting, never wanting to leave. No thrill rides here. I wouldn't want this book to go any faster, and miss out on the much more satisfying road trip in summertime with the top down. In Nate in Venice, as in Straight Man, Empire Falls and Nobody's Fool, there's his signature sense of humor, giving you plenty of laugh out loud moments as well. It just doesn't It's almost torture that Russo has written a Novella of less than 100 pages, but I'll take it. In Nate in Venice, as in Straight Man, Empire Falls and Nobody's Fool, there's his signature sense of humor, giving you plenty of laugh out loud moments as well. It just doesn't get any better than this! 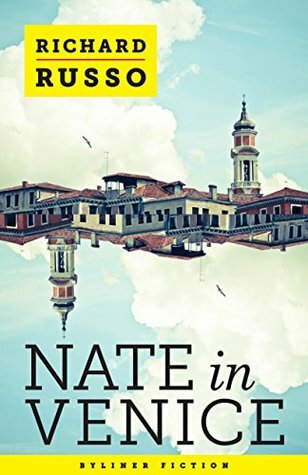 I just finished reading Nate in Venice, a novella, and I am terribly disappointed by it. I was looking forward to reading my first Richard Russo text and found it dull. I am sorry to say that his narrative voice is plain bad. He doesn't allow the characters to come alive, instead, he mentions every thought of his hero, Nate, and builds up the story to be something that is ultimately, not enjoyable. I found the plot about his student to be dry, it never leads to anything climactic. I'm so bummed I just finished reading Nate in Venice, a novella, and I am terribly disappointed by it. I was looking forward to reading my first Richard Russo text and found it dull. I am sorry to say that his narrative voice is plain bad. He doesn't allow the characters to come alive, instead, he mentions every thought of his hero, Nate, and builds up the story to be something that is ultimately, not enjoyable. I found the plot about his student to be dry, it never leads to anything climactic. I'm so bummed it wasn't good. I wanted this to be better, being a fan of R. Russo. Perhaps my expectations were too high for a novella, but I got very little sense of place (which is a shame, being set in Venice), and the characters felt underdeveloped, like there was something going on off camera. Part of that could be due to the fact I just finished Heft which in contrast to Nate, portrays a remarkably vivid English professor. This is a novella about a retired English professor who takes a tour to Venice with a group that includes his older, almost-estraged brother. As with all Russo works, it is engaging and enjoyable. Due to the nature of the short format, things felt rushed (Nate falls in love with and feels like he has found a soulmate in the space of 48 hours). But it was a breath of fresh air from the author's normal offering of hard-scrapple life with messed-up men living out lives of quiet desperation. Richard Russo does it again. Wonderful! I was transported to Venice to watch over,and observe the bewildered and searching Nate as he tries to make sense of what it means to be connected to another. Russo is a master at developing the character of his subjects. One can't help but somehow feeling both antagonistic and sympathetic toward Nate as he struggles inanely through his Venice adventure bent on fulfilling a promise made to his mother. All the while recalling the misgivings of his life in higher education. It is a good read, as are all of Russo's works.